One of the most vivid visual art styles to emerge in the last fifteen years is a wonderful way to create a unique Halloween costume for yourself or your little inventor! Find Steampunk Costumes for kids and adults, including corsets, wings, hats, masks, boots, geared-up necklaces, and lots of other fun accessories! How might have things turned out for us if history had taken a more twisted, bizarre course? What if instead of living in the digital age we were living in the age of steam and iron? Welcome to the world of steampunk. This mashup of Victorian England with a post-apocalyptic future where 19th century technology collides with supernatural occurrences has created a passionate subculture in the past few years. 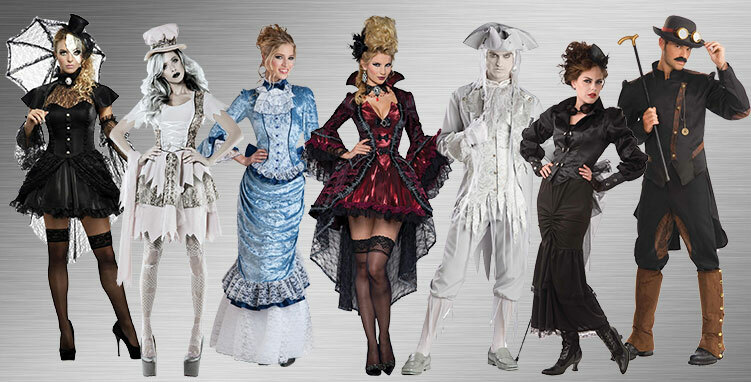 Steampunk is most recognizable as a style of clothing—a fashion statement—and here at Buy Costumes, we have some of the loudest, most pointed statements for you to make. The world of steampunk is a big one and we have costumes from all corners of the steampunk world. So wind the gears and fire up the gas lamps because things are going to get adventurous. Whoever you feel like being—a pirate, a gentleman or a renegade—we've got the outfit to go with your inner punk. No matter what alternative universe you find yourself in, there’s going to be a bartender, and mixing and shaking up drinks is a necessity in the steampunk world. 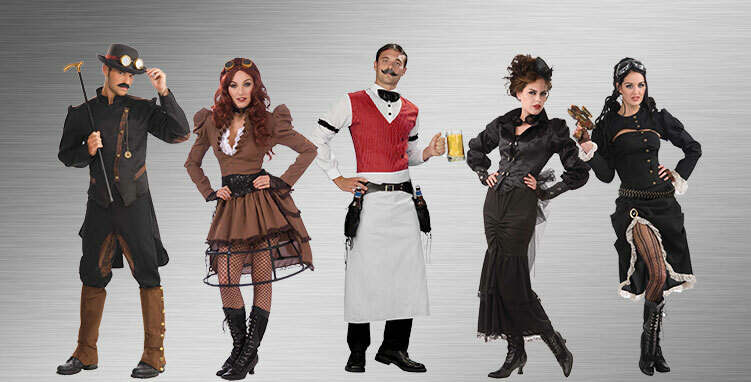 With the bartender costume you’ll be ready to serve up gin, ales and rounds of pints. 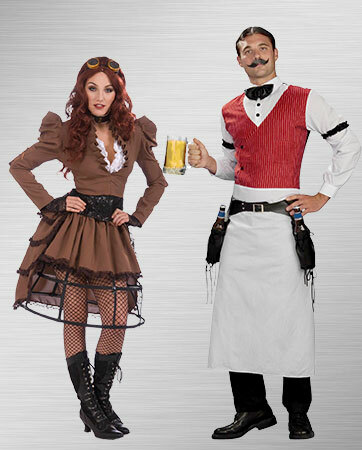 This costume comes with a bartender’s vest and shirt, plus an apron, arm garters and a bow tie. To top it all off, there’s a unique bottle holster so you’ll always have a refreshing drink at your side. A dash of charm, a slice of intrigue and a spry bit of posh, served neat. That’s the recipe we followed while putting together the outfit for this steampunk gentleman. In this getup, you’ll be ready to go anywhere your coal-fired flying machine takes you, and whether it’s dangerous, romantic or involves mingling with high society, you'll look ready for an occasion. The costume includes the distinctive jacket and breeches, which are the foundation of any respectable wardrobe. As inspired as you are, this kitschy mash-up of 19th century English propriety with the rough-necked, no-rules-apply wild west is just the stuff of high society in the steampunk world. Perfect for an all-night gala that you expect might turn into a massive brawl, or for fixing up the coal furnace on your steam-powered airship. The costume includes a ruffled V-neck white top and fitted jacket with puffy sleeves. A caged petticoat, brown skirt and faux leather belt complete it all. Propriety and good manners have taken a back seat with this costume. Dressed as a steampunk renegade, you’ll burst in on the upright society and really shake up their gears and pistons. So whatever kind of trouble you're setting out to cause, you’ll find your inner tech-savvy rebel here. The costume includes a black jacket and skirt, both trimmed with white lace frills, and a corset. No need to get out your ratchet and tune up your time machine, because we’ve got the costumes to transport you back to the Victorian Age. But this is a very different period from the one you read about in history class. This is the alternative, reimagined world of steampunk, and we have the outfits to make sure you fit in. Step inside our haberdashery for elegant breeches for the gentleman and a form-hugging corset for the lady. We have the clothing for the fanciest occasions. If you’re tastes are more Gothic, there’s the intricate Victorian Vampire costume or the creepy Victorian doll outfit for your otherworldly tastes. Speaking of otherworldly, if you don’t feel like you’re fully human, we have some amazing ghost costumes for both men and women that will make you look like you’ve been dead for the past 150 years. The Steampunk world is all about opposites coming together. It’s the collision of cultures, of old and new, technology and tradition, and of course, man and woman. Make an entrance into this world with your special someone at your side. The Gentleman’s eveningwear is tailored to match the latest social fashions and includes a distinctive jacket and breeches. Steampunk Vicky is dressed in a ruffled V-neck white top and fitted jacket with puff sleeves. A caged petticoat, brown skirt and faux leather belt complete it all. Some ladies spend so much time tinkering around on engines that by the time evening comes around, they can’t decide what to wear. Then of course, there are those who have been dead for far too long. Do they have anything to match the fashions of the time? Paired together, they make their own style. The Victorian costume comes with a black fitted skirt and jacket. The Victorian Vamp includes a red and black satin shimmer dress with pleated accents, lacy sleeves, satin skirt with attached petticoat, ribbon lace-up closure with keyhole back, and a lace choker. Even in the alternative reality of steam and monocles, the need for a cold refreshing drink hasn’t changed at all. So belly up to the bar with your partner and get ready for a night of perfect pints. These two costumes are for the pair who is ready to party like Queen Victoria just made a decree to celebrate. The Saloon Gal costume comes with a pink, adjustable bodice and a ruffled, free-flowing skirt. The bartender’s costume comes with a vest and a shirt, apron, arm garters, bow tie and a unique bottle holster. Most people get rid of their toys when they grow up. But this little girl didn’t. She grew and her toy grew with her, and the results are just plain creepy. But this is what it’s like in the world of large, mechanized toys. The Victorian costume comes with a black fitted skirt and jacket. The doll has an elegant mini black dress with ruffled seams and embellishments. The low-hanging button-up bodice provides a seductive counterpoint to the disturbing mask. The sleeves, hat and parasol are also included. If you’ve dabbled in the world of steampunk, you know that any strapping gentleman is going to have to be dressed to the nines. Accessories are everything and there is no end to the accessories you’ll need to make the right impression. Starting with the most basic need of a Victorian gentleman—the mustache—we have you covered. Our bushy brown Man Mustache applies easily and stays in place with a self-adhesive strip. 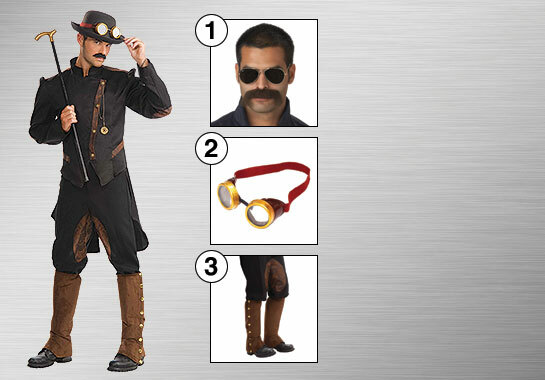 Of course, we also have the most iconic piece of steampunk fashion—the goggles. Whether you’re planning to fix the pistons on your flying machine or just planning to nerd out, it’s likely that you’ll be wearing these goggles long after the party is over. Finally, we’ve crossed in the speculative dimensions to bring you the most outrageously cool pair of boots this side of the 19th century. Well, they’re not boots, but spats. You've probably never heard of spats before, but after you wear these things once, you’ll wonder why they weren't part of your wardrobe for the past ten years.